If you follow competition lead climbing and you have done your homework, you surely know Angela Eiter as one of the most amazing athletes our sport has ever seen. If you don’t follow competition climbing, Miss Eiter is a great starting point to begin your education. Here’s why: three World Cup Seasons, four World Championship, six Rock Masters, the European Championship and the World Games. Angy has been on the podium of every senior lead competition, with a career total of 63 podiums (40 gold medals, 16 silver medals and 7 bronze medals) out of 102 international competitions in the senior circuit. 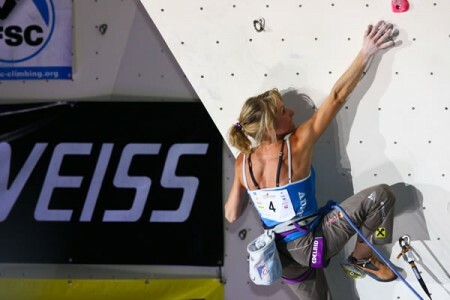 After a decade of successes in the senior circuit, Angy has decided to retire from competitions in order to focus on coaching young athletes and climbing outdoors. As she announced her retirement a few weeks ago, we were surprised not to see much web coverage about the departing champion. So we decided to roll up our sleeves and get in touch with the Austrian fairy, who was happy to answer our very many questions. Hello Angy, it’s great talking to you! We wanted to start the interview by going back in time a bit. You had your first World Cup season at the senior level in 2002, aged 16. Already the following year you managed to get 5 podiums (two gold and three silver) and to finish the overall season in third place. In 2003, you also won your first Rock Master. What do you remember of those early years? What were your objectives and how did you work towards them? I didn’t really have any objectives, I just wanted to compete and see what I was able to do. I was still in school so I tried to make the most of my training knowing that I didn’t have so much time for it. At the time I was training six times a week. Two of these sessions were in the morning, up to two hours, which was possible because I was attending a sports high school. The other four sessions were in the afternoon. High school lasted until 2005, when I was 19. However, your golden period started when you were still busy with school! In fact, between 2004 and 2007 you won 3 of the 4 World Cup seasons, 3 out of 4 Rock Masters, both World Championships and the World Games. We are looking at an incredibly high concentration of victories in international competitions over a good period of time. What made the difference at that point? I think that, first of all, I was motivated because I won some competitions in the previous years, like you said. And then I had better training, I started to have a professional trainer. In 2005 Red Bull became my sponsor and this was a very important part for me because they supported me with professional training and physiotherapy. Of course the OeAV (the Austrian Alpine Federation) supported us with some financial help but we didn’t have, for instance, physiotherapy. So for me and for the other athletes this change was important. From 2008, the Federation also gave us much more support too. How would you split those years of great successes between the training and the actual moment of performance? It’s not always easy to really channel all of your preparation in the climb? I know what you are saying really well because when I doing youth competitions, my trainer always called me “World Champion in Training” but I was never that successful in the actual competitions. So I started to do some mental training with a specific coach and then I improved and got better. It really helped me. I think that climbing is a mental sport, you have to be very focused during the climb. You can make mistakes very easily. You have to focus your mind and there are some exercises that can help you to stay focused and calm. It can be something like yoga, I would recommend anything that you like and works quite naturally. Were there specific weaknesses you have worked on throughout your development? Yes. Big, hard to control moves have always been difficult for me and slopers, too. For the first weakness, I worked a lot on improving my dynamic skills and coordination, but it was also a matter of self-confidence. For the second one, I just spent more time on slopers, to get the feeling and the power for them. In 2005 you had the best season of your career, taking 12 (twelve!) gold medals and one silver medal out of the thirteen international competitions you participated in. How did you manage to pull off such an extraordinary, near-perfect performance? Was it extra motivation, better training, a particularly good period in the circumstances outside climbing? I think that at the time I was very motivated to do everything very professionally. I was thinking of what I could do better all the time. In general, I was also in very good mental and physical shape. But the extra push, I got it from my father. He followed me everywhere; he stayed with me at all comps and training sessions. He was working fulltime but always managed to be there for me. I was really proud of him. How did you feel at the end of that season and approaching the following one? Did you think that you had reached a peak already or did you think that it was possible to climb just as well for another year? Usually I don’t think about the results in advance, I just want to try to do my best in any given situation, at the right moment. For me every year was a new challenge. You never know for sure how the other competitors will perform, what shape you are going to be in. You just have to cope. I don’t think there is much point in thinking too much before the actual moment. You can see that climb in full here. In 2008, you suffered a major shoulder injury which required surgery and ended your season prematurely in September. What can you tell us about that bad period? How long was it before you felt fit and strong to be competitive again? The shoulder injury was very hard for me. I felt like I had fallen in a big hole and thought to myself “life is over now!”. I couldn’t climb at all for half a year, I couldn’t believe it. But I put up with it. I got a lot of motivation from my family, they supported me a lot and my physiotherapist too. Thinking back, it was very important for me to go step by step and, again, not to think of other things like the level of climbing I had. I took things step by step and took it slowly. What suggestions would you give to an injured climber who is looking at many months of reduced or no climbing? I experienced that you have to accept the situation and let the injury heal. Unluckily, if you are injured in your upper body and/or arms, you have to avoid climbing. If you climb before healing is complete, the injury won’t get away and you might have problems later on. Then, you have to focus, set goals but step by step. Did the injury challenge you more on the physical side or on the mental side? It’s hard to tell, it was both. Because you get weaker and weaker and in my case, I lost a lot of power. For some time, all I could do was cycling on a stationary bicyle with an ergometer and walking, because of the shoulder I couldn’t even go running. Even just dead hangs or finger work were out of the question. I couldn’t even train just the uninjured side because there was the risk of developing unbalances. This all affected me mentally. So I searched for other activities to do while recovering for example I went to a business school teaching economics, accounting and marketing. Even after the injury, you managed to do extremely well in single event competitions such as the World Championships (gold in 2011 and 2012) and the Rock Master (gold in 2009 and 2011). Do you think these comps suited you better than an entire World Cup season? Yes, they did. It became a question of aims, at that point I had to make plans. These one-off events became so important for me and the training changed to suit that schedule too. How did you come to the decision of leaving competitions? After all, you are still the reigning World Champion from the Paris event in 2012? I still really liked and enjoy competitions, but I am not ready anymore to sacrifice everything for the comps. Because, as you know, climbing on rocks is such an important aspect for a climber and this was missing in my life. I also picked up other interests, things I would have to sacrifice if I were still a competition climber. You have to train, travel for competitions, do training camps, there isn’t really much time left. Now I’ll have more time for the things I like, such as reading, walking, hiking, be a coach. I really like to coach other people. What are the most important lessons you have learned in your career when it comes to training and preparation? I have learned that life is not really a thanksgiving, you have to do hard work to achieve something. And what about the moment of performance? What are the things that are really important for you to do well? I think it’s very important that you have passion and motivation. As a consequence, in the moment of performance, you should be filled with positive energies because it means you really love what you are doing. Focus and determination are also important. You were the first Austrian athlete to win international competitions consistently at the senior level. About ten years later, the Austrian team is one of the strongest in the world. Do you think that your successes helped younger climbers (and coaches too) to work harder and better? Yes, I remember being a bit of an idol for athletes and trainer, because I showed what was possible. We also got better support from the Austrian federation. And who are, in turn, your climbing heroes? For sure François Legrand, who won 4 World Cup seasons in a row in the early 90s, plus many other titles. And Lynn Hill among the women. When we are travelling together, it’s always a funny team, especially with Jakob and Mario : ) Heiko, [the head coach of the Austrian team] is also great. Sometimes when we have some time off, we always spent time together, playing cards for example. What do you think a lead competition should challenge the athletes with? What should it be about? This is quite a difficult question! To me, they should be creative routes, interesting for the audience to see and for the athletes to climb. The athletes should have fun during climbing, while pushing themselves to their limit. Not too many athletes should fall at the same point. I think it’s very important that the route setters keep developing professionally and stay in touch with the climbers. Do you think today’s routes are different compared to those of 5-6 years ago or before? Do you think they are a better overall test of a climber’s abilities? Some think that endurance has become almost too important, with rests being reduced in an attempt to speed up things… Would you agree? Yes, I believe there is a little difference in the style, which became more dynamic sometimes. The holds are also different now, there are many manufacturers around and this can also influence the climbing style in a way. Because you can really see the difference. The difficulty of the route has also gone up. When I started to compete, routes had quite separate parts. First it was easy, then very hard moves. It was more like routes on rock, you know: easy part, then hard part, then easier again. But now, from the beginning to end, you feel like the difficulty is increasing through the route. Can you tell us something about the training and coaching you will be giving to young athletes? How is “Coach Angy” going to be like? For me it will be very important to pass my experience to the young athletes. In my career, I have experienced positive things and negative things. I want to pass on those that worked while keep on trying to understand why some others didn’t work. And for me it’s also very important to have a good human relationship with my athletes, I want to be a friend to them. How did you live your outdoor climbing during the competition years, when you had to train very often? When I climbed outside during the competition season, it was to get motivation. Sometimes you are so fed up with the structured training indoors that you just want to get out. Unluckily, you can’t do that too much, because that you lose some fitness needed for competitions, so you have to stay in the gym. But for me, climbing on rock is not just focusing on the grades and the difficulty. It is more about being there with friends and completing projects I like regardless of the grade, focusing together on something. 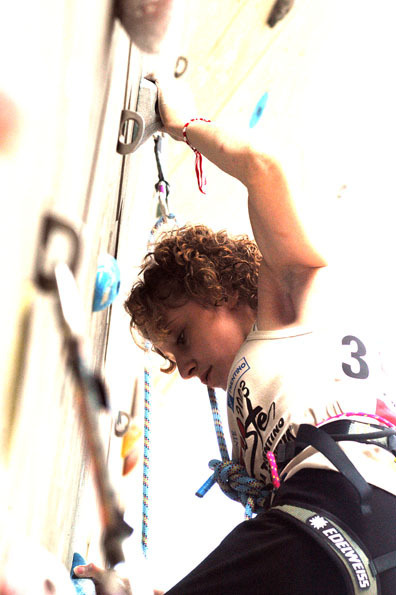 Do you have specific targets for rock climbing now that you have retired from competitions? First of all I would like to visit a number of climbing spots together with my friends. I haven’t seen that many yet, so I would like to go the USA, Kalymnos or some other areas of Spain. I would like to do multi-pitch routes, more bouldering, just try different things. What about you in the “horizontal world”? What do you like to do when you don’t climb? What gets you interested and passionate? In winter I like to stay active, I have found a new passion in cross-country skiing and snow walking. I like to stay in the nature with friends and those who will be my athletes. Now that I can stay outdoors, I really want to! For the rest, I am still interested in economics and languages. I have learned French and Italian and maybe I can improve them. One final, personal question: why did you climb? And what will be the reason to keep going in the future? And you need to think about it, you have to solve problems as if it was crosswords. 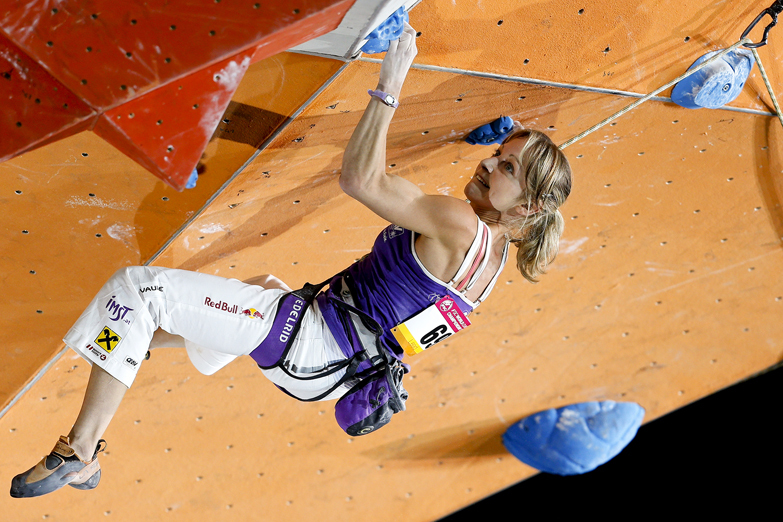 Angela Eiter is sponsored by La Sportiva, Edelrid, Vaude and Red Bull. Check out the four links for short profiles about Angy.